Shirdi Sai Baba Stories,Leelas and Teachings. : Method Of Doing One Lakh Sai Naam Jaap -By Devotee Radha . 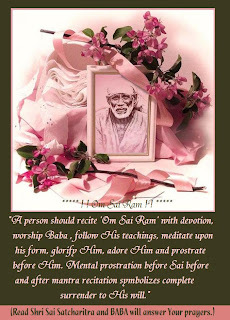 Method Of Doing One Lakh Sai Naam Jaap -By Devotee Radha . Last week I had published Sai experience shared by sister Radha from Japan under the title"Power of Sai Naam Jaap and Vow to Sai Baba" . She had narrated in her experience how she performed Sai Naam Jaap in her tough time and received Baba's blessing after she completed her Naam Smaran of one lakh times . After reading her experience many devotees inquired through mail for the method of Sai Naam Jaap sister Radha followed and desired to know the exact method of performing one lakh Sai Naam Jaap . I communicated the same to sister Radha and promptly she replied back giving all the details .I am attaching her mail and devotees are requested to go through it .Devotees who have queries or any doubt can write below this post their questions and sister Radha shall reply the same here . It must be Baba's wish that many are curious to know of the naam jaap. I think Baba's name is the sole object of our lives. Well, it is very simple. Only it requires a bit of commitment and discipline. I feel that if I can do it, anyone can do it, because I am not all that great in both commitment and discipline. Of course, above all, we all know that it is Baba's grace that makes us do this. I will outline the things I do to do the naam jaap. Sorry my mail might be long. 1. You can choose a simple name of Baba. I choose 'SAI'. 2. I pray my wish to Baba and tell Him to guide me through the entire process by giving me concentration and faith. 3. I pray to Lord Ganesha to protect me from any disturbances or hurdles. 4. I start it on any day, it need not be a Thursday or anything. I also have a completion date in mind. It depends on the problem I have at hand. If it is a very serious problem which requires quick solution I keep the deadline to finish short. For instance, I have once told 1 lakh in 24 hours. But, I think to pressurize ourselves into such small time frame can compromise on the depth of repetition. It might seem like some racing game which is not so good. 1 week seems like a comfortable time for me for 1 lakh chant, but you can choose the time frame. Also if the frame is too long, we might take it lightly and relax too much (at least that is my tendency!!). 5. I start repeating 'sai sai sai' 'sai sai sai' 'sai sai sai.' I treat this as one line of naam jap. If you notice there are 9 sais in this line. So I say, 'sai sai sai; sai sai sai, sai sai sai' then say 1. Then again I say sai sai sai; sai sai sai; sai sai sai, 2. Sai sai sai; sai sai sai; sai sai sai 3; so on and so forth. So if you have said sai sai sai: sai sai sai; sai sai sai 100, we have said 900 times sai's name. Mark this 900 in a piece of paper or something, I keep a post it paper on the refrigerator and keep marking if I have made a 900 repetitions. 6. I cant finish this if I have to sit in one place and do the naam jap, as I also have a family to take care I have to keep saying this even when i do house work. However, when I have time I do sit down and say this. It is ok to say this while we are going about out daily work. Afterall, our duties are as important as our prayers. 7. It might seem very tedious, but trust me, Baba makes it very easy. If you try this you will find it takes only 15- 20 seconds to say this one line 'sai sai sai; sai sai sai; sai sai sai' 10 times. That is how easy it is. 8. On the other hand, there is another method if we are sitting down and saying this. If we notice there are 3 lines across our fingers in our hand. That means there are 15 lines in each hand. I repeat sometimes this one line of sai sai sai; sai sai sai; sai sai sai' touching one line, so I would have said 30 one lines in both hands. Each line has 9 sais so 30 x 9 we have said 270 times. This method requires a bit more attention and I think it is difficult to do it unless we are sitting and concentrating and doing this. 9. I add up the numbers i have recorded and when I know that I am nearing the completion, I usually offer a small prasad to Baba, fruit, candies, anything and pray for forgiveness for any mistakes on my part and say a 100 extra one lines of sai sai sai touching Baba's feet in the idol or picture and complete the 1 lakh naam jaap. 10. I mentioned as 1 lakh. You can choose the number of repetitions. It can be 10008 or 1008 or more. Unacheivable numbers can tire us down so it is better to be realistic.That is all it is. I hope I have explained how to do the jaap properly. It is Baba's grace I was inspired to do this in the first place. May He shower His blessings on all. You have explained it very nicely, i was planing to write to Manisha Didi about same. Sairam. This is wonderful and so easy! Thank you Radhaji! With due apologies, I have slightly modified this to suit my convenuence and let me share it here. Instead of 3 cycles of 'Saisaisai, 'Saisaisai, 'Saisaisai', which I find a bit difficult to keep the count[!! ], I make only one Saisaisai, which is 3 and using the finger count, as you have nicely explained, make 30 for each cycle. And I make a 10 cycles of this which adds upto 300 for each completed cycle. Now, all I have to make is 333 cycles of this, which adds upto 99.900. And the final 108 I propose to do in front of Sai to complete a 1,00.008 naam jap. I am sure Baba will help me thru this and hear my prayers! Thank you once again and SAIRAM. Thanks Manisha Ji for posting this. I had asked you about this in the earlier post and you promptly replied to me. I was planning to start the Sai Naam Jaap on Thursday and I see this post, it gave me real happiness for the beautiful coincidence and leela of Baba. I feel that Baba is blessing me and guiding me that I am doing the Jaap ok. I am really happy to see so many people have started the naam jaap with Baba's grace. Of course, shankar kumar ji you can chant in any way you might find easy. After all, there is no rules to repeat Baba's sweet name. May baba bless all and especially Manisha ji for bringing this sadhana to thousands of people. Please help me Radhaji. I am Aswathy. I am in one big trouble. I want to talk to you. but how to contact? Please help me, Please.... My mail id is aswathyvstvlm@gmail.com. Will you please give your mail id. i am very after reading this, thank you manisha didi, u gave me some hope. simply write SAI in computer like SAI 30 times in a line then copy paste it to make the desired number for chanting, print out and keep it in chanting place,,read it and tick the number of lines chanted, this will to keep very clear record of chanting.